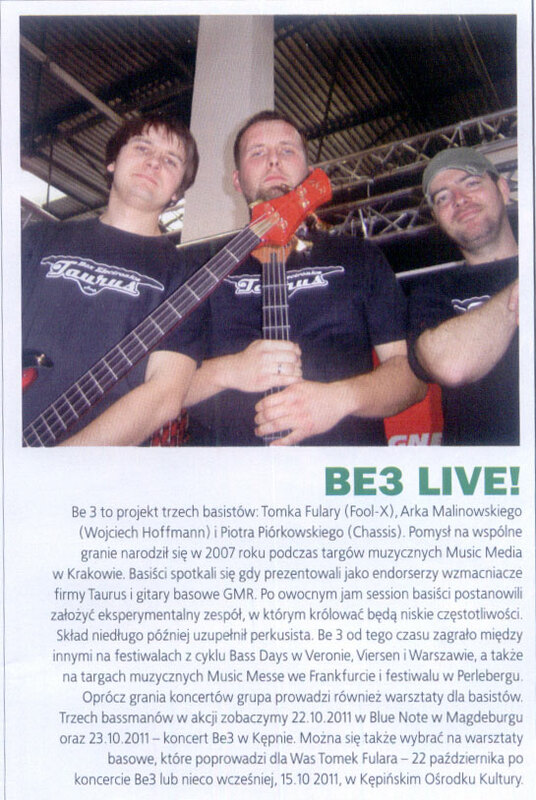 Check out photos from gig of Be3 bass group in Kepno. Gig of the Be3 bass group in Blue Note club in Magdeburg was very successful. Check out the pictures. Check out new photos from gig of the Full-X trio in club Niebo. Wroclaw, october 2011. -Midi Guitar Dumper for tapping guitar players. Check out new web-engine function: connection between Critical Acclaim and Photos. Now watching press reviews you can click on gallery connected to the same event, and another way - watching photo gallery, you will see also press reviews of the same event. New statistics are running now - based on AWStats system. The website has 350-400 visits per day now. Check out Full-X trio drummer site. Michal Bednarz plays with the band since april 2011. The name of the band has been changed from Fool-X to Full-X. It's a consequence of new counterpoint direction of music which will be included on the second CD called "An introduction to counterpoint". Oct 11, 2011 - Critical Acclaim update! -Be3 Live! "Bass Player" Polish ed. Oct 06, 2011 - New layout - www.adam.fulara.com! Check out new photos from gig of the trio at the Perleberg Festival 2011. 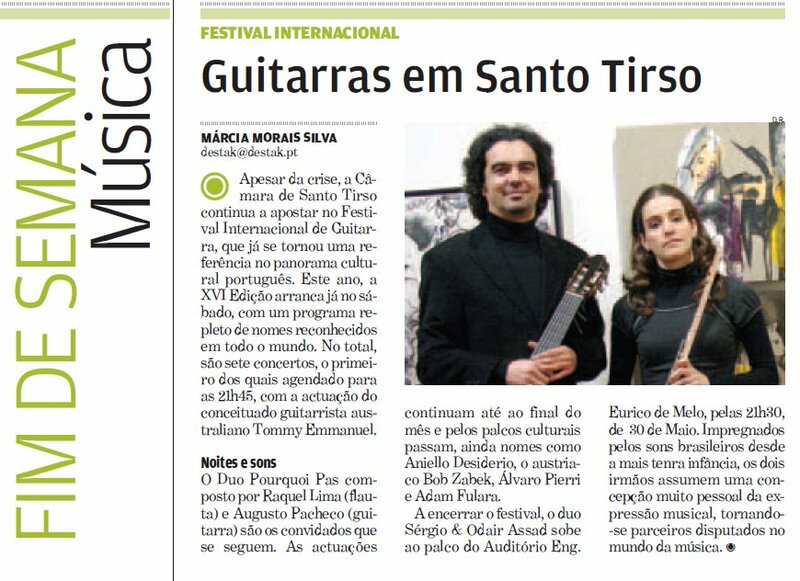 Gig at the "Jazz in Stare Siolo 2011" was a great success. Pictures are available in gallery. Check out the new review in Critical Acclaim section. It's an review including short workshop section with "For Elise". English language, "Music Maker" magazine, Jun 2009. 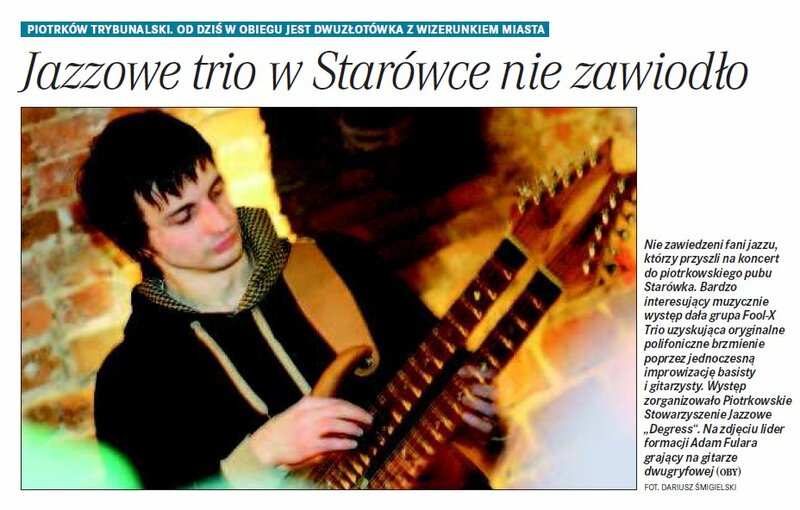 Check out pictures from Fool-X trio gig and workshops in "Improwizacja" jazz club (April 2011). REK Counterpoint with Merlin Pickups is the new doublenecked signature of Adam Fulara. This guitar has piezo and MIDI system onboard. Check it out: photos. New recordings soon! Check out producer site. Two new press reviews (about Tom Fulara and Be3 band) from german press has been placed in Critical Acclaim section. Check it out. Check out new MIDI JS/VST plugin - Mipressor. It's a MIDI dynamics expander/compressor. Check out Adam's freeware VST/JS effects placed in new software section. At the moment there are 2 new JS effects: one for midi vibrato, and one for playing guitar MIDI with one instance of NI Kontakt VST. New photos from bass workshop in Magdeburg (Germany), Blue Note Club, Dec. 2010.